Commercial overhead door systems, loading docks, dock levelers, and truck restraint systems all contain mechanical parts that can break or fail. What happens in the event that you have an obsolete or uncommon door or loading dock system and you experience a part failure that is seemingly difficult to replace? Who can you call to get help in the Lower Mainland? DoorTech Industries is a full service commercial door and loading dock repair specialist in Vancouver, BC. One of our speciality services is our ability to custom fabricate parts, or make welding repairs to commercial door systems and loading docks. Our fully equipped service trucks are equipped with welding tools and our technicians are specially trained to weld on doors and loading dock accessories such as truck restraint systems and dock levelers. We have a red-seal certified millwright on staff (he’s the owner!) and we can address and repair many mechanical problems that other maintenance companies simply couldn’t do. We have a fully equipped fabrication shop capable of completing a range of small, custom projects specially suited for overhead commercial door systems, security solutions, loading dock and door repairs and more. Loading docks and their mechanical systems are used constantly and thus prone to damage that isn’t a simple fix. 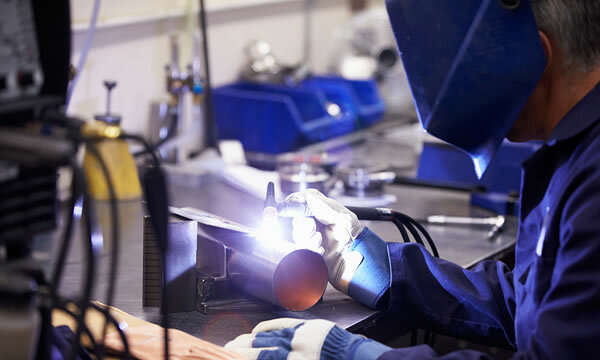 Often times cracks will develop due to stress, metal mechanical housings can break, or an accident could cause some damage to metal parts that would require a welding repair. DoorTech Industries service trucks are equipped with welding equipment and a certified welder can take of your repairs on-site. If any custom fabrication is necessary we’ll be able to complete that too. Metal overhead doors, rolling doors or high speed door systems are prone to damage such as employee neglect or misuse and even just wear and tear from the constant use in your business. If your any metal part of your commercial door system has broken and needs repair you can count on DoorTech Industries to make it right. One of our fully equipped service trucks can be dispatched to your location, complete with a welding unit and certified welder to carry out the repairs. Sometimes the right door or loading part isn’t available, or would be too expensive to replace when it could easily be repaired by a competent welder. DoorTech Industries is there when you need to have something small fabricated or welded for your commercial door or loading dock system. Give us a call or fill out one of our online forms today.